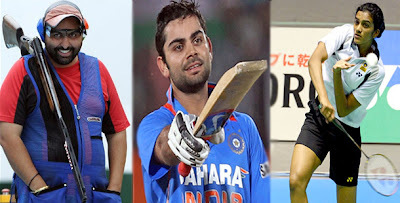 Trap shooter Ronjan Sodhi, the first Indian to win two back-to-back World Cup gold medals, was on Tuesday recommended for the prestigious Rajiv Gandhi Khel Ratna, while star cricketer Virat Kohli was among the 14 sportspersons picked for the Arjuna award by the selection committee. Rising badminton player PV Sindhu, who became the first Indian woman shuttler to clinch a bronze medal at the recent World Championships, was also in the list of 14 sportspersons picked for the Arjuna award, sources said. 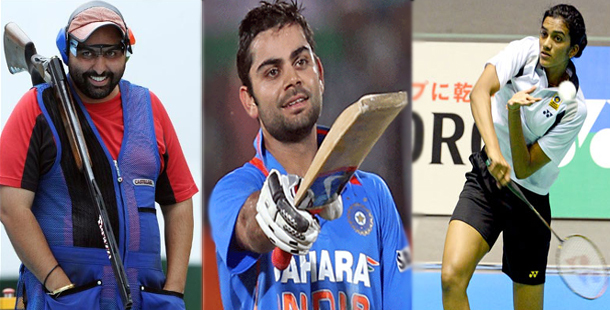 Apart from Sindhu, triple-jumper Renjith Maheshwary, who won a bronze medal at the 2010 Commonwealth Games with a national record, and rising golfer Gaganjeet Bhullar were among the sportspersons picked for the Arjuna award this year by the selection committee headed by billiards legend Michael Ferreira. Sodhi, who had a disastrous outing at the London Olympics last year, is a former world number one. He was a double trap gold-medallist at last year's Asian Games besides being a silver-medallist at the Commonwealth Games. Vijay, a London Olympics silver medallist, was the joint winner along with wrestler Yogeshwar Dutt, who won a bronze at the same event. This year's Arjuna awardees list features just one boxer, World Championship bronze medallist Kavita Chahal. The list includes quite a few women with veteran squash player Joshna Chinappa, former hockey captain Saba Anjum, paddler Mouma Das, wrestler Neha Rathi and shooter Rajkumari Rathore recommended for the award. Not to forget archer Chekrovolu Swuro, who was part of the silver medal-winning team in the 2011 World Cup. The Arjuna awardees: Virat Kohli (Cricket), Chekrovolu Swuro (Archery), Renjith Maheshwary (Athletics), PV Sindhu (Badminton), Kavita Chahal (Boxing), Rupesh Shah (Snooker), Gaganjeet Bhullar (Golf), Saba Anjum (Hockey), Rajkumari Rathore (Shooting), Joshna Chinappa (Squash), Mouma Das (Table Tennis), Neha Rathi (Wrestling), Dharmendra Dalal (Wrestling), Amit Kumar Saroha (Parasports).